I'm going to try a new series, doing brief histories of interesting ships. 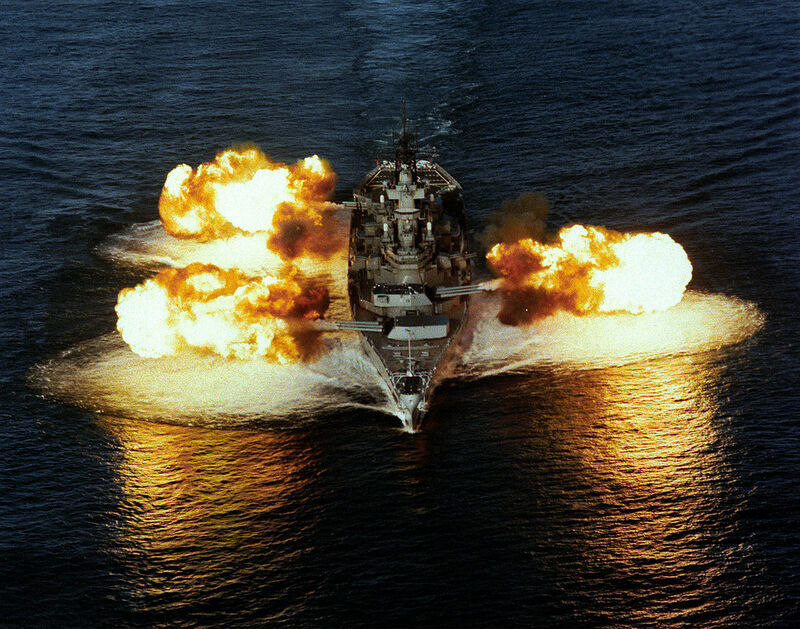 I'll start with the other three Iowa class battleships, in order, which brings us to the USS New Jersey, BB-62. New Jersey was ordered at the same time as Iowa, from Philadelphia Naval Shipyard. 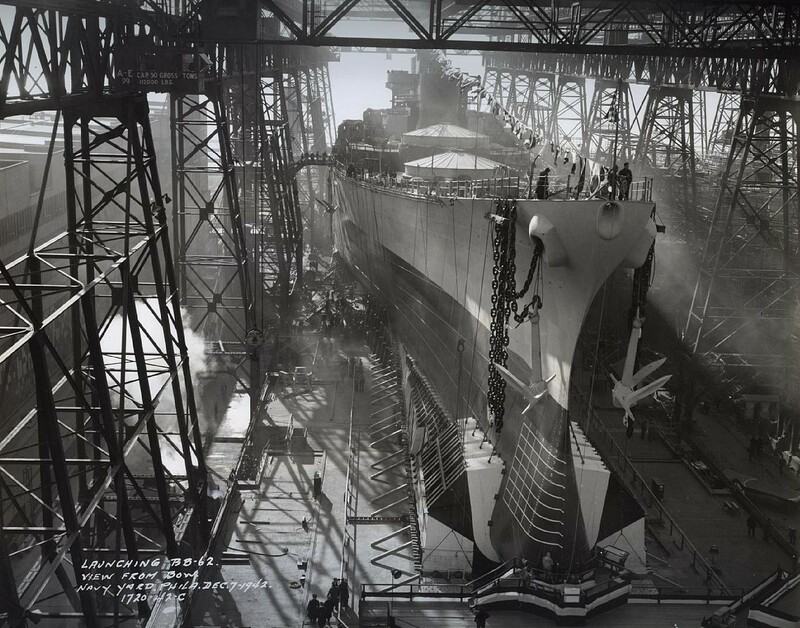 Launched on December 7th, 1942, and commissioned on May 23rd, 1943, she spent the next 6 months working up in the Atlantic. On January 7th, 1944, she, in company with Iowa, passed through the Panama Canal, and into the Pacific. The two ships stayed together when they joined the Fifth Fleet, where Admiral Spruance chose New Jersey as his flagship. He was aboard her during the sweep around Truk, and kept his flag aboard until mid-April, including the bombardment of Milli. New Jersey stayed in action until mid-April of 1945. Until Iowa left for her refit in December of 1944, the two ships were usually in company. In August, when Admiral Halsey took over and the Fifth Fleet became the Third Fleet, New Jersey again flew the flag of the fleet commander. She spent her time screening carriers, with the usual sideline of bombarding enemy-held territory. Finally, she was relieved by Iowa, and returned home for a refit. She missed the surrender, not reaching Japan until September 17th, where she remained until January of 1946. In 1948, she was placed into reserve at Bayonne. 1950 saw New Jersey reactivated to replace Missouri on the gunline off Korea. She first fired her guns against Wosan on May 20th, 1951, and took the only casualties of her combat career when she took a hit from a shore battery near Turret 1. One man was killed and two wounded. The next six months saw New Jersey cruising up and down the Korean coast, bombarding targets and providing support to the troops on the ground much like Iowa did the next year. 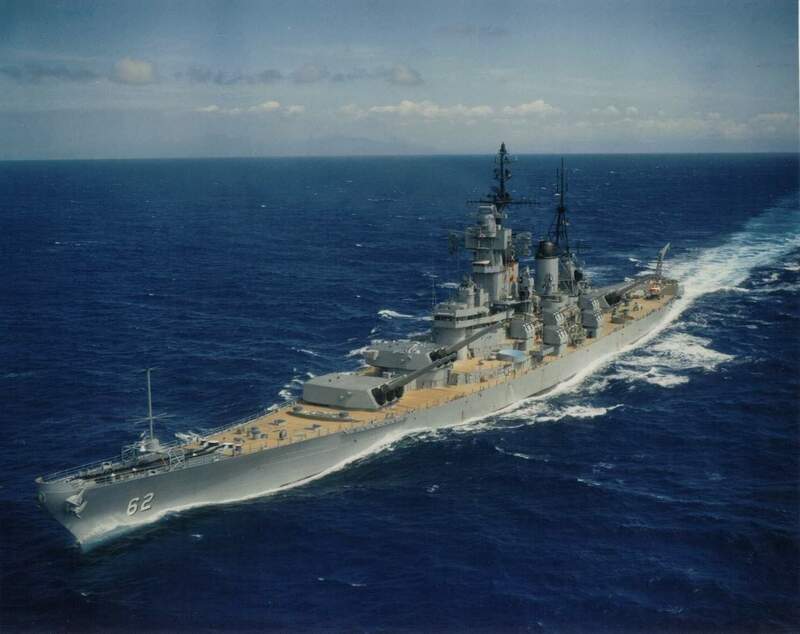 New Jersey returned to Norfolk for an overhaul and a European training cruise, then was sent back to Korea in April 1953 for a second stint, again relieving Missouri. While the war ended with a truce on July 27th, Jersey remained in the far east until October, when she was relieved by Wisconsin. The next three years saw her operating in the Atlantic, doing training cruises to Europe and the Caribbean. On August 21st, 1957, she was inactivated at Bayonne. A decade later, the horrendous losses of US aircraft over Vietnam had the Pentagon hunting for alternatives. 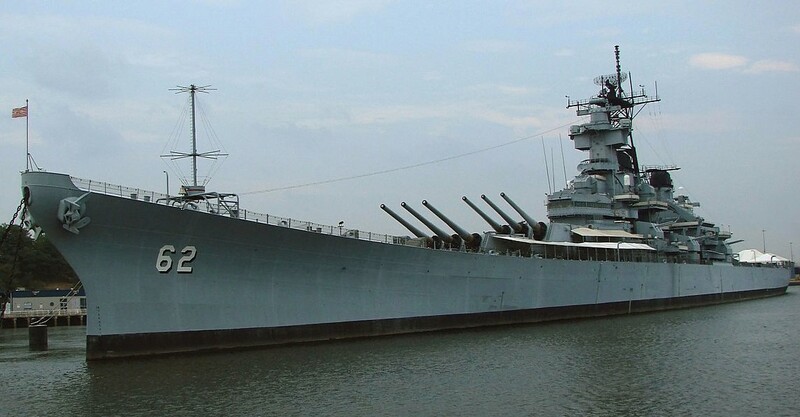 New Jersey was selected as being in the best material condition of the four ships. She was quickly reactivated, with all of the 20mm and 40mm antiaircraft guns removed and a new electronic warfare suite installed to protect against anti-ship missiles. 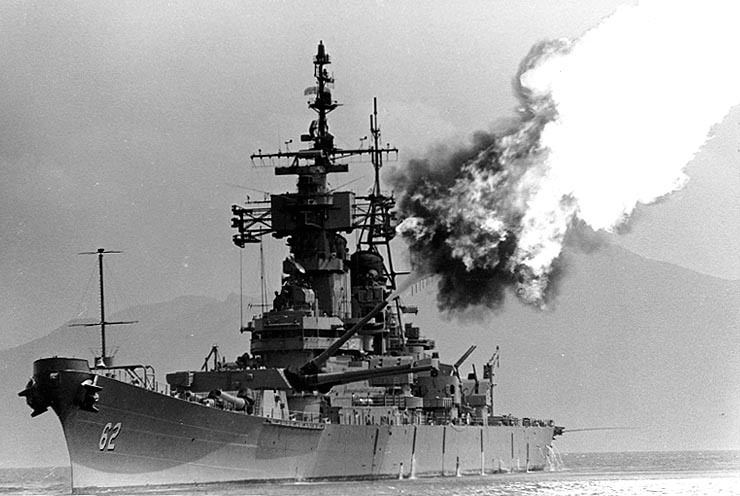 On April 6th, 1968, the US Navy had a battleship in commission again. Thousands of men volunteered to serve aboard her, although the rush to get the ship into action meant that only 10% of the crew actually were volunteers. Despite this, she was a happy ship, and was unique among large ships off Vietnam in that not a single man deserted before she sailed. To save manpower, the total crew was only about 1,550, barely more than half her WWII compliment. A notable omission was the Marine detachment, which lead to fears that the North Vietnamese would board and capture her. 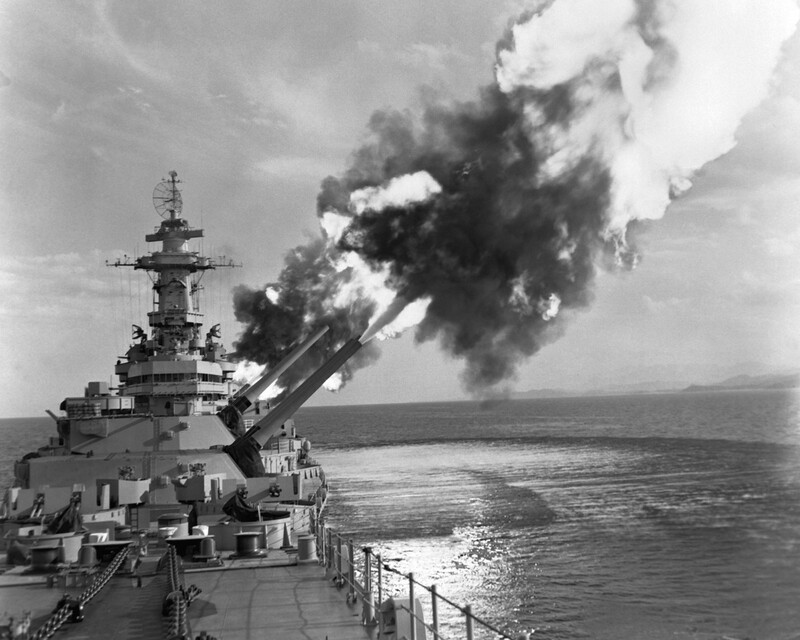 September 30th, 1968 saw 16" shells falling on targets near the DMZ, the first time a battleship gun had been used in anger in 15 years. Her 6-month stint on the gunline was wildly successful, even though LBJ had restricted operations above the 19th parallel in a gesture of peace in April of 1968. Among other things, New Jersey destroyed over 650 bunkers, and was known to clear helicopter landing zones 200 yards across with a single 16" HC shell. 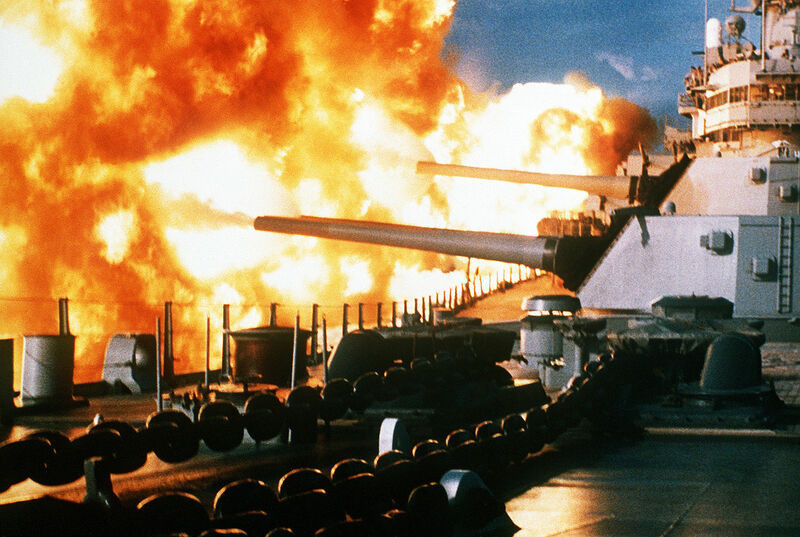 The 5,688 16" shells used equaled her ammunition expenditure in WWII and Korea combined. Her return to the US was interrupted by a crisis triggered when North Korea shot down a US airplane, but just as she reached Japan, the crisis ended and she returned home two weeks late. In August, as she was preparing for a second deployment, the order came down from Washington to decommission her. It was claimed that this was an economy measure, but in the early 80s, it came out during Congressional hearings that it had been because the ship was seen as an impediment to negotiations.2 On December 17th, 1969, New Jersey was decommissioned at Puget Sound Naval Yard, next to Missouri. New Jersey's captain had decommissioned her with the words "Rest well, yet sleep lightly; and hear the call, if again sounded, to provide fire power for freedom." That call came in the early 80s. New Jersey was the first back into service, as she was in the best shape after her deployment to Vietnam. She returned to service on December 28th, 1982, with a full suite of upgrades. Her shakedown cruise was a memorable one. She was dispatched to the Pacific in June 1983, getting as far as the Gulf of Thailand before being recalled at the end of July. The situation with Nicaragua was getting interesting, and she was wanted to show the flag. In September, as she should have been returning home, she was instead sent to Lebanon, where a bloody civil war was raging. A month after Jersey's arrival, the Marine barracks in Beirut was attacked by a suicide bomber, killing 241 Americans. New Jersey didn't respond immediately, as it wasn't obvious who had carried out the attacks. Her chance came on December 14th, when she fired 11 16" shells at antiaircraft guns that had fired on US aircraft. This was merely a warm-up for the main even. On February 8th, 1984, she fired over 300 rounds at targets around Beirut. 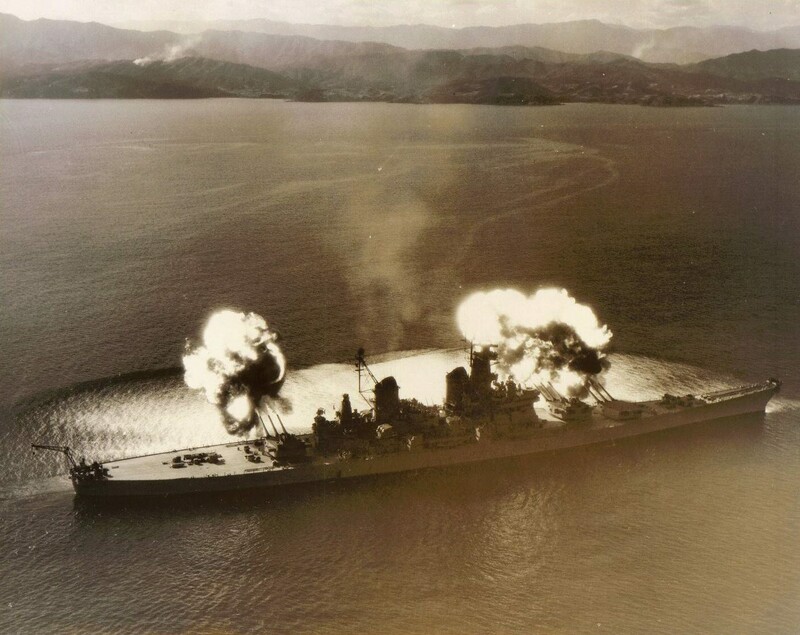 Unfortunately, it was one of the low points of US battleship gunnery. The exact details are still unclear, but the shooting was wildly inaccurate, in some cases with shells reported to fall as much as 10,000 yds off target.3 The culprit is said to have been poorly-blended powder, and a program was put in place to improve gun accuracy. New Jersey finally returned to her home port of Long Beach in May of 1984, 11 months after leaving on a 3-month shakedown cruise. Her crew demonstrated incredible endurance, at one point going without shore leave for 111 days. She next deployed in 1986, going north into the Sea of Okhotsk and south to Thailand, providing a presence that relieved the strain on the carrier groups. Her 1988 cruise saw her off the coast of Korea during the 1988 Summer Olympics, and her final cruise in 1989-1990 saw her get into the Persian Gulf. 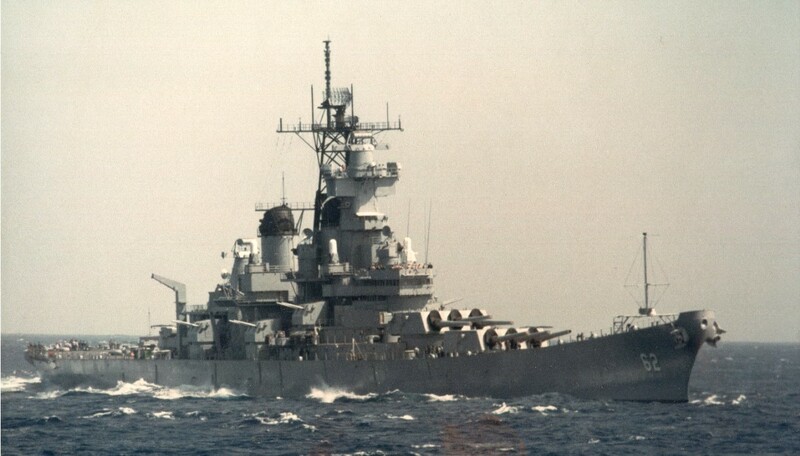 With the end of the Cold War, she and Iowa were to be decommissioned, and New Jersey followed her elder sister into retirement on February 8th, 1991. Since 2001, New Jersey has been a museum ship in Camden, near Philadelphia. She has the most battle stars of any battleship in US history, and holds an important place in the history of the US Navy. Next time, I'll cover Missouri, the third unit of the Iowa class. I see you've got a lot more of those "shockwave hitting the water from a broadside" photos. Such photos being so fantastic that they are probably 50% of the reason these old girls kept getting called back into service. Were those fears of North Vietnamese boarding and commandeering her at all credible, or just put in for color? Speaking of, what's the last case of a battleship/ship of the line being successfully boarded under combat conditions? That's probably not untrue. But they're so pretty, and I had a whole ship's worth to play with this time, instead of having to spread them out over 8 posts. As far as I know, they were completely baseless. I don't know when the last combat boarding of a major warship was. I suspect it was during the Napoleonic Wars, because of how lethal weapons got in the next few decades. A notable omission was the Marine detachment, which lead to fears that the North Vietnamese would board and capture her. Are normal sailors not armed? I would expect that they would be able to defend the boat. And if 1500 armed sailors aren't enough to defend against a boarding, why would 3000 turn the tide? I didn't say that the fears were rational. Most ships off North Vietnam didn't have Marine detachments, and had smaller crews than Jersey, so it's hard to see why a 45-man Marine detachment was necessary. That said, sailors get some basic weapons training, and a few get more. I'm not sure what was going on at the time, but these days, ships are expected to provide their own security from terrorism and similar threats. They don't go armed all the time, but I doubt the weapons locker was totally empty, either. I can’t think of any particularly situation where this would be useful. But you have to admit, it looks cool. My first that was the Nelsonian-era tactic of breaking the enemy's line of battle, but even if gunnery ranged didn't militate against that, it's a much less viable tactic for a ship with gun turrets than for a ship with separate main batteries on each broadside. My second though was that it might be useful for fighting off a swarm of lighter ships attacking from multiple directions, but that's what the light quick-firing guns are supposed to be for. My second though was that it might be useful for fighting off a swarm of lighter ships attacking from multiple directions, but that’s what the light quick-firing guns are supposed to be for. I guess if they're really close, the muzzle blast will take care of them pretty well. Post-Napoleonic boarding: I'm trying to find anything between the Napoleonic Wars and ironclads coming into widespread use. I think at least one ship of the line was captured by boarding at the 1833 Fourth Battle of Cape St. Vincent (part of the Portuguese civil war) where a British-led Loyalist squadron attacked and defeated a superior Miguelite force. But that's less than two decades later, and I don't think technology had changed that much in the intervening years. Later on there were boarding actions in the War of the Pacific, ending with the ironclad Huascar, the flagship of the Peruvian Navy, being boarded and captured by Chile- though in that case there was no resistance as the Huascar was severely damaged. In fact, the Chileans thought it had surrendered as its ensign had been shot away! Previously, Huascar had repelled attempts at boarding by the crew of a ship it had rammed. Blast. How could I forget Huascar? I wrote two posts on her. That said, she was small and fairly old by then, so it's not like a modern battleship being taken. There were a couple of opposed boardings during WWII, most notably the Altmark incident, but they weren't of major warships.